Pericles, the greatest statesman of ancient Greece, was born of distinguished parentage in the early part of the fifth century B.C. His father was that Xanthippus who won the victory over the Persians at Mycale, 479 B.C. ; and by his mother, Agariste, the niece of the great Athenian reformer, Cleisthenes, he was connected with the princely line of Sicyon and the great house of the Alcmaeonidae. He received an elaborate education, but of all his teachers the one whom he most reverenced was the serene and humane philosopher, Anaxagoras. Pericles was conspicuous all through his career for the singular dignity of his manners, the Olympian grandeur of his eloquence, his "majestic intelligence" in Plato's phrase, his sagacity, probity, and profound Athenian patriotism. Both in voice and in appearance he was so like Pisistratus, who had once overturned the Athenian republic and ruled as a king, that for some time he was afraid to come forward in political life. When he entered on public life Aristides had only recently died, Themistocles was an exile, and Cimon was fighting the battles of his country abroad. Although the family to which he belonged was good, it did not rank among the first in either wealth or influence, yet so transcendent were the abilities of Pericles that he rapidly rose to the highest power in the state as the leader of the dominant democracy. The sincerity of his attachment to the popular party has been questioned, but without a shadow of evidence. At any rate, the measures which, either personally or through his adherents, he brought forward and caused to be passed, were always in favor of extending the privileges of the poorer class of the citizens, and, if he diminished the spirit of reverence for the ancient institutions of public life, he enlisted an immense body of citizens on the side of law. He extended enormously, if he did not originate, the practice of distributing gratuities among the citizens for military service, for acting as dicast and in the Ecclesia and the like, as well as for admission to the theatre--then really a great school for manners and instruction. Pericles seems to have grasped very clearly, and to have held as firmly, the modern radical idea, that as the state is supported by the taxation of the body of the citizens, it must govern with a view to general interests rather than to those of a caste alone. About 463, Pericles, through the agency of his follower, Ephialtes, struck a great blow at the influence of the oligarchy, by causing the decree to be passed which deprived the Areopagus of its most important political powers. Shortly after the democracy obtained another triumph in the ostracism of Cimon (461). During the next few years the political course pursued by Pericles is less clearly intelligible to us, but it is safe to say that in general his attitude was hostile to the desire for foreign conquest or territorial aggrandizement, so prevalent among his ambitious fellow-citizens. Shortly after the battle of Tanagra (457), in which he showed conspicuous courage, Pericles magnanimously carried the measure for the recall of Cimon. His successful expeditions to the Thracian Chersonese, and to Sinope on the Black Sea, together with his colonies planted at Naxos, Andros, Oreus in Euboea, Brea in Macedonia, and AEgina, as well as Thurii in Italy, and Amphipolis on the Strymon, did much to extend and confirm the naval supremacy of Athens, and afford a means of subsistence for her poorer citizens. But his greatest project was to form, in concert with the other Hellenic states, a grand Hellenic confederation in order to put an end to the mutually destructive wars of kindred peoples, and to make Greece one mighty nation, fit to front the outlying world. The idea was not less sagacious than it was grand. Had it been accomplished, the semi-barbarous Macedonians would have menaced the civilized Greeks in vain, and even Rome at a later period, might perhaps have found the Adriatic, and not the Euphrates, the limit of her empire. But the Spartan aristocrats were utterly incapable of appreciating such exalted patriotism, or of understanding the political necessity for it, and by their secret intrigues the well-planned scheme was brought to nothing. Athens and Sparta were already in that mood toward each other which rendered the disaster of the Peloponnesian war inevitable. When the Spartans, in 448, restored to the Delphians the guardianship of the temple and treasures of Delphi, of which they had been deprived by the Phocians, the Athenians immediately after marched an army thither and reinstated the latter. Three years later an insurrection broke out in the tributary Megara and Euboea, and the Spartans again appeared in the field as the allies of the insurgents. The position of Athens was critical. 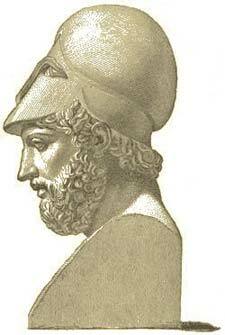 Pericles wisely declined to fight against all his enemies at once. A bribe of ten talents sent the Spartans home, and the insurgents were then thoroughly subdued. The thirty years' peace with Sparta (445) left him free to carry out his schemes for the internal prosperity of Athens. Cimon was now dead and was succeeded in the leadership of the aristocratic party by Thucydides, son of Melesias, who in 444 B.C. made a strong effort to overthrow the supremacy of Pericles by attacking him in the popular assembly for squandering the public money on buildings and in festivals and amusements. Thucydides made an effective speech; but Pericles immediately rose and offered to execute the buildings at his own expense, if the citizens would allow him to put his own name upon them instead of theirs. The sarcasm was successful. Thucydides was ostracized, and to the end of his life, Pericles reigned the undisputed master of the public policy of Athens. During the rest of his career "there was," says the historian Thucydides, "in name a democracy, but in reality a government in the hands of the first man." And the Athens of his day was the home of AEschylus, Sophocles, Euripides, Anaxagoras, Zeno, Protagoras, Socrates, as well as Myron and Phidias; while there flourished at the same time, but elsewhere in Greece, Herodotus, Hippocrates, Pindar, Empedocles, and Democritus. The centre of this splendid group was Pericles, of whom the truthful pen of Thucydides records that he never did anything unworthy of his high position, that he did not flatter the people or oppress his adversaries, and that with all his unlimited command of the public purse, he was personally incorruptible. Soon after this the Samian war broke out, in which Pericles gained high renown as a naval commander. This war originated in a quarrel between Miletus and the island of Samos, in which Athens was led to take part with the former. The Samians, after an obstinate struggle, were beaten, and a peace was concluded (439). The position in which Athens then stood toward many of the Greek states was peculiar. Since the time of the Persian invasion, she had been the leader of the confederacy formed to resist the attacks of the powerful enemy, and the guardian of the confederate treasury kept in the isle of Delos. Pericles caused the treasury to be removed to Athens, and commuting the contingents of the allies for money, enormously increased the contributions to the patriotic fund, Athens herself undertaking to protect the confederacy. The grand charge against Pericles is that he applied the money thus obtained to other purposes than those for which it was designed; that, in short, he adorned and enriched Athens with the spoils of the allied states. To his mind Hellas was subordinate to Athens, and he confounded the splendor of the dominant city with the splendor of Greece, in a manner possible to a man of poetic imagination, hardly to a man of the highest honor. His enemies, who dared not attack himself, struck at him in the persons of his friends. Phidias was flung into prison for the impiety of introducing portraits of himself and Pericles into the battle of the Amazons depicted on the shield of the goddess Athena in the Parthenon; the brilliant Aspasia, the famous mistress of Pericles, was arraigned on a charge of impiety, and only acquitted through the eloquence of Pericles on her behalf; while the aged Anaxagoras was driven from the city. It is unnecessary to give a detailed account of all that Pericles did to make his native city the most glorious in the ancient world. Greek architecture and sculpture under his patronage reached perfection. To him Athens owed the Parthenon, the Erechtheum, left unfinished at his death, the Propylaea, the Odeum, and numberless other public and sacred edifices; he also liberally encouraged music and the drama; and during his life, industry and commerce were in so flourishing a condition that prosperity was universal in Attica. At length, in 431, the long foreseen and inevitable Peloponnesian war broke out between Athens and Sparta. The plan of Pericles was for Athens to adopt a defensive attitude, to defend the city itself, leaving Attica to be ravaged by the enemy, but to cripple the power of Sparta by harassing its coasts. The story of the war must be told elsewhere; here it is enough to say that the result was unfavorable to Athens for reasons for which Pericles was only in small part to blame. He trusted in the ultimate success of Athens, both from her superior wealth and from her possessing the command of the sea, but he had not calculated upon the deterioration in her citizens' spirit, nor upon the robust courage of the Boeotian and Spartan infantry. Nor was his advice to keep behind the city walls rather than face the enemy in the field, best calculated to arouse the Athenians' courage. The plague ravaged the city in 430, and in the autumn of the following year, Pericles died after a lingering fever. His two sons had been carried off by the plague, he had been harassed by a charge of peculation brought by Cleon, and the actual infliction of a fine by the dicastery, while he had been without office from July, 430, to July, 429, but before the last he recovered his hold over the Ecclesia, and was gratified in the closing days of his life by its legitimation of his and Aspasia's son. As a statesman his greatest fault was a failure to foresee that personal government is ultimately ruinous to a nation. He taught the people to follow a leader, but he could not perpetuate a descent of leaders like himself. Hence we cannot wonder, when days of trouble broke over Athens, how that men spoke bitterly of Pericles and all his glory. Yet he was a lofty-minded statesman, inspired by noble aspirations, and his heart was full of a noble love for the city and her citizens. Plutarch tells the story that, as he lay dying and apparently unconscious, his friends around his bed were passing in review the great achievements of his life, and the nine trophies which he had erected at different times for so many victories. The dying patriot quietly interrupted with the characteristic sentence: "What you praise in my life belongs partly to good fortune, and is, at best, common to me with many generals. But that of which I am proudest, you have left unnoticed--no Athenian has ever put on mourning through any act of mine."